Accueil E.L.T. Outils pédagogiques E.M.I.L.E. / C.L.I.L. 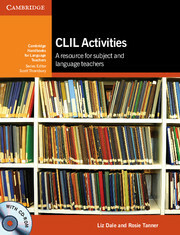 CLIL Activities is organised into five chapters: Activating, Guiding understanding, Focus on language, Focus on speaking and Focus on writing. A further chapter provides practical ideas for assessment, review and feedback. The Background to CLIL section offers a clear explanation of what CLIL is and its benefits and challenges. Dedicated subject pages include annotated extracts from authentic school teaching materials, demonstrating how language is used in the following subjects: Art, Design and Technology, Economics and Business Studies, Geography, History, ICT, Maths, Music and Drama, Physical Education and Science. The accompanying CD-ROM contains print-ready CLIL activities.